the coded segments currently called up in the “Retrieved Segments” window. The search can also be limited to those documents that are currently activated in the “Document Browser”. Go to the Analysis menu tab and click at the bottom of the Lexical Search entry. 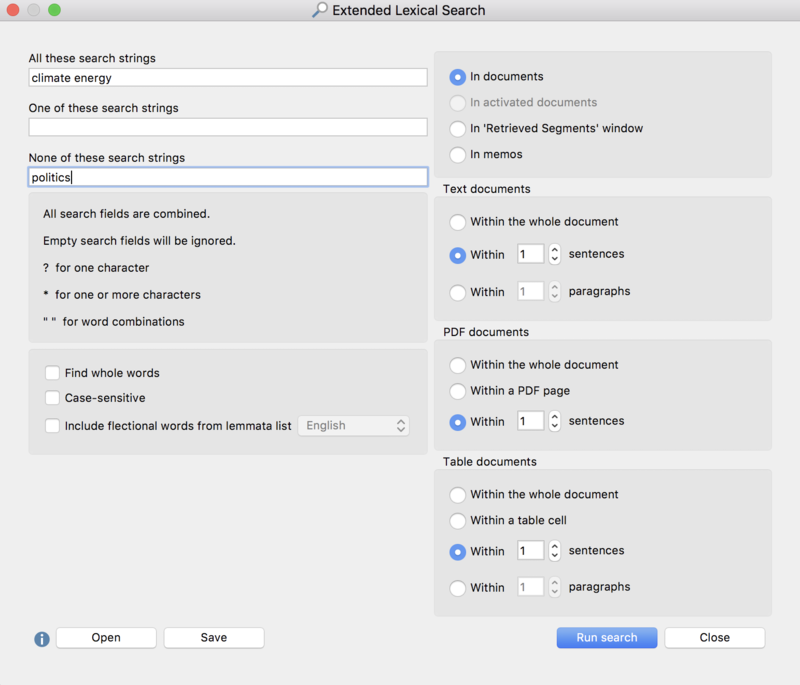 From the drop down menu select Extended Lexical Search. Please note, that you can separate different search strings with a space. If you want to enter a combined search string you can use quotation marks like “Mahatma Gandhi” around your search string. Question mark (“?”) and asterisk (“*”) work as placeholders for a single character or for one or more charaters. Use <(word) for word begin and (word)> for word end, <(inter) will find “interest” and “interesting”, but not “winter”, and (ks)> will find “banks” and “thanks”, but not “bankside”. Tip: Please be aware that hyphenation can not be recognized in PDF-documents. In the upper right part of the dialog you can define, in which part of the project MAXQDA will search an in the options on the right you can define in which context the search items have to exist. All three search entries will be combined with AND. In the screen above MAXQDA will present all sentences in which “climate” and “energy” exist together, but not “politics”. # A number that is not four digits appears before a period (e.g. 1. or 2.). # A single character appears before a period (to exclude abbreviations). # Two identical characters appear directly before a period (e.g. ff. or pp.). # Literal speech in quotation marks belonging to the sentence itself. # First letter after a sentence is in small letters. # A number appears directly following the end of a sentence. # Quotation marks appear immediately after the end of a sentence. In text or table documents, a new sentence invariably begins after a paragraph. The recognition of sentences in PDF documents is optimized for left-to-right languages and may not work as expected with right-to-left languages.